Welcoming a new kitten into your home can be one of your happiest days as a pet lover. That little ball of fluffy fur can be playful, gentle, wild, crazy, and delight you with her antics. Over the years she will grow to be your close friend and companion. Your first days with your kitten are important. Much depends on choosing the best kitten food so your little friend can grow and be healthy. There are a wide range of kitten foods available today. With so many choices, choosing the right food can be confusing. Should you feed your kitten dry food? Wet food? Which ingredients are best? We can help you decide. 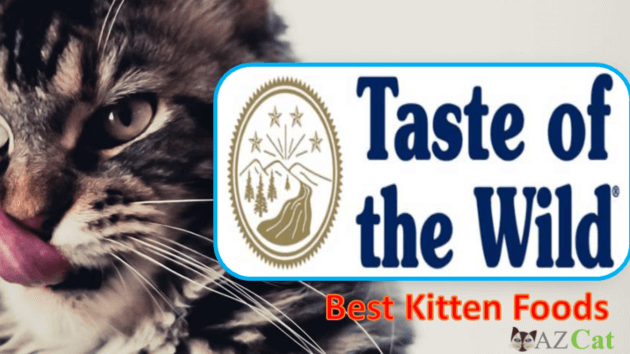 Below you will find our reviews of the eight best kitten foods available today. They are divided into the best dry kitten foods and the best wet kitten foods (wet refers to canned or tinned foods). Always popular, BLUE Wilderness High Protein Grain Free Kitten Dry Cat Food is a delicious, protein-rich food that kittens love. It features deboned chicken – a good named meat protein for your kitten. The food has no chicken or poultry by-product meals. It also has no corn, wheat, or soy and no artificial ingredients. This is a grain free cat food so sweet potatoes are used as a source of complex carbohydrates. Taurine, an essential amino acid that is so important for cats, is added to help with your kitten’s heart and eye development. BLUE Wilderness High Protein Grain Free Kitten Dry Cat Food includes Lifesource Bits which are made up of a precise blend of vitamins, minerals and antioxidants for your kitten’s health. This is a high protein food with 40 percent minimum crude protein so it provides plenty of protein for your growing kitten. First on our list of best dry kitten foods is IAMS Proactive Health Kitten Dry Cat Food. Recommended by veterinarians, this food is formulated with nutrients like those found in a mother cat’s milk. It provides 100 percent complete and balanced nutrition for your kitten with zero fillers. The food is specially designed to support the health of growing kittens (1 year and younger) while it helps build a strong immune system. Essential minerals help develop strong bones in your kitten and taurine gives your kitten good eyesight. Omega-3 DHA promotes healthy brain development. Antioxidants help build a strong immune defense. Chicken is the first ingredient, helping to meet your kitten’s need for meat. IAMS Proactive Health Kitten Dry Cat Food has 33 percent protein. Hill’s Science Diet Dry Kitten Food has a new and improved taste with the same great nutrition that pet lovers have liked for decades. This formula is recommended for kittens from weaning until 1 year. It can also be fed to pregnant and nursing adult cats. It provides natural DHA for ideal brain and eye development in your kitten. It also has a clinically-proven combination of antioxidants so your kitten will have a strong immune system – so important for good health throughout her life. The ingredients are easy-to-digest and include natural ingredients plus vitamins, minerals, and amino acids. There are no artificial flavors, colors, or preservatives. According to Hill’s, they work with more than 220 veterinarians, food scientists, technicians and Ph.D. nutritionists to develop their formulas. The first ingredient in this food is chicken. Hill’s Science Diet Dry Kitten Food has 38.1 percent protein (dry matter basis). Taste of the Wild Grain Free High Protein Natural Dry Cat Food is another high protein, grain free food that has become very popular with cat lovers. This is an all life stage food so it can be fed to both kittens and adult cats, as well as to pregnant and nursing cats. Meat proteins in this food include roasted venison and smoked salmon so it has an optimal amino acid profile to help your kitten develop good muscles. It includes added vitamins and minerals, fruits and vegetables as a source of antioxidants for immune system health; and a blend of fatty acids for healthy skin and coat. This food has no grain such as corn or wheat; no filler ingredients, and no artificial colors, flavors, or preservatives. It is easy to digest and Taste of the Wild uses propretary probiotics that last through the manufacturing and shipping process and thrive in your kitten’s gastrointestinal tract. Contains added taurine. The first ingredient in Taste of the Wild Grain Free High Protein Natural Dry Cat Food is chicken meal. The food has 42 percent protein from chicken meal, roasted venison, smoked salmon, ocean fish sources, and vegetable sources of protein. Wellness Complete Health Natural Grain Free Wet Canned Cat Food Pate Recipe is a grain free food that completes complete and balanced nutrition. It comes in a number of different formulas including one for kittens. The kitten formula contains 97 kcal per 3 ounce can. This formula does not contain any carrageenan which is often found in wet or canned foods as a gel thickener. Some studies have suggested that carrageenan is harmful to the gastrointestinal system. The formula includes added taurine for good eye and heart development. It’s made from premium, all natural ingredients. There are no meat by-products, artificial colors, flavors, or preservatives. Higher protein and fat levels support the development of strong bones, muscles, and healthy organs. A lower magnesium level is good for urinary tract function. Wellness Complete Health Natural Grain Free Wet Caned Cat Food is a pâté. The first ingredient is chicken. It has 11 percent crude protein. Whole Earth Farms Grain Free Real Healthy Kitten Recipe is an all life stage food. Made with holistic, natural ingredients, it provides kittens with complete and balanced nutrition. Cooked in America with multiple protein sources, vitamins, and minerals. This formula is easier to digest and provides your kitten with a shiny coat, healthy skin, and more energy. Includes added taurine for your cat’s health. It has no corn, wheat, soy, by-products, and no artificial colors or artificial preservatives. The first ingredient in this food is deboned chicken. It comes in 5 ounce cans and has 133 kcal per can. Whole Earth Farms Grain Free Real Healthy Kitten Recipe has 9 percent minimum crude protein. This is a pâté. Purina Fancy Feast Classic Pate Feast Wet Kitten Food has been around for years and it remains popular. This food has 85 kcal per 3 ounce can. Most cats and kittens love fish so this food is often a favorite. Contains added taurine. Formulated especially for kittens. This kitten food is also a pate. This is a complete and balanced food. The first ingredient is ocean whitefish. It has 12 percent minimum crude protein. NUTRO Wet Cat Food comes in various formulas. 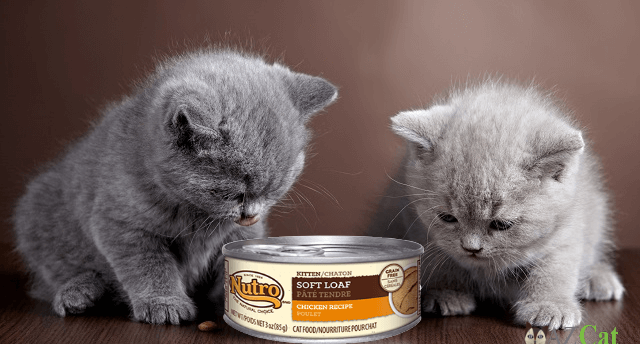 NUTRO Kitten Soft Loaf Chicken Recipe Canned Kitten Food is made specially for kittens. This is a soft loaf-style food which gives is a smooth texture. It has 94 kcal per 3 ounce can. This is a grain free formula. It has no corn, wheat, soy, or artificial colors, flavors, or preservatives. Includes added taurine. The first ingredient in NUTRO Kitten Soft Loaf Chicken Recipe Canned Kitten Food is chicken. It has 13 percent minimum crude protein. With Vitamin E, Vitamin A Supplement, Vitamin D3 Supplement, Biotin, Vitamin B12 Supplement, Folic Acid. There are two basic kinds of foods for cats and kittens: dry foods (kibble) and wet foods (canned or tinned foods). Dry foods are made into a dough, sent through an extruder, cut into small pieces, and cooked. Dry foods are popular with owners because they are so easy to feed and store. They are usually a little less expensive than wet or canned foods. Wet foods contain more moisture than dry foods. The moisture may be water, broth, or a gravy. Cats and kittens usually love wet foods. Some of them can be higher in fat, sodium, or some minerals so if your cat or kitten has any health issues, it’s important to read the label carefully. Many experts today recommend wet food for cats and kittens over dry food to help avoid urinary tract problems. Many owners also like to feed their cats and kittens a mix of dry and wet food or keep some dry food down for their cat and feed wet food at meal times. If you feed your kitten dry food or a mix of dry and wet food, make sure you are providing plenty of fresh water at all times to help avoid urinary tract problems. To buy the best wet or dry food for your kitten, we recommend reading the food label. The label will provide you with a great deal of information. Along with manufacturing information, it will also tell you the ingredients in the food, for example. Some ingredients are better than others for your kitten. Some ingredients are of higher quality than others. Ingredients to avoid in your kitten’s foods include too many carbohydrates and filler ingredients. The label will also provide information about the guaranteed analysis for the food. The guaranteed analysis tells you the percentages of crude protein, crude fat, fiber, and moisture. These things, along with carbohydrates, make up most of what’s in your kitten’s food. It’s important to know how much of these nutrients you are feeding your kitten. In order to make wise buying decisions, you can compare these percentages to other foods. It’s usually easy to compare one dry kitten food to another. It can be a little more difficult to compare a dry food to a wet food because of the moisture content. Dry foods usually appear to have more protein but that’s only because most of the moisture has been removed from these foods. For example, a can of wet cat food may have 12 percent crude protein and 78 percent moisture. This may seem low in protein compared to a dry food that has 40 percent crude protein and 10 percent moisture. If you remove the moisture, the wet food would have about 54 percent protein; the dry food would have about 44 percent protein by comparison. This is a dry matter basis comparison. Both foods have lots of protein but doing the dry matter basis (DMB) comparison allows you to have a truer look at the foods. As with many things, the cheapest food is often not the best food for your kitten. Good quality food, whether it’s wet or dry, is often a better choice since it will provide better nutrition for your kitten. Cats have some unique nutritional needs that make them different from dogs or other animals. For example, they are “obligate carnivores.” This means that they must have meat in their diets. They can’t digest carbohydrates and starches as easily as dogs can. The recommended minimum protein percentage for an adult cat is 26 percent. However, a growing kitten will need even more protein. She will need a minimum of 30 percent protein in her food until she becomes an adult. Cats also need the essential fatty acid arachidonic acid in their diet. It is found in animal fats. They need taurine (another amino acid) and an active or pre-formed version of Vitamin A which is only present in foods of animal origin. You may see it on a cat food label as retinyl palmitate. They also need arginine, an amino acid. Niacin is also important to their diet because they can’t synthesize much of it in their own bodies. Look for a food that is specially made for kittens or one that is for “all life stages.” These foods have the nutrients that your kitten needs for growth. Never feed a cat or kitten dog food. Dog food doesn’t provide cats with the nutrients they need. Your kitten will grow to become an important part of your life and member of your family. Feeding her the best kitten food from the start will help her live a long and healthy life. Whether you choose dry or wet food, look for good ingredients, plenty of meat, and try to avoid artificial flavors, colors, and preservatives. Keep carbohydrates low. And, of course, provide your kitten with plenty of fresh, clean water at all times. If you do these things, you and your kitten should spend many happy years together. Thank you Science Diet for my Kitten’s health! It’s for kittens and for elderly cats too! I have a 16-week-old kitten, Loki, and the vet said it was good to give her some wet food along with the dry so I purchased some Fancy Feast. Wow, it’s like kitty crack! The minute I take a can out of the box she is trying to crawl up my leg in anticipation! I generally give her one can a day, at nighttime. I give her dry kitten food during the day. The morning after I gave her the Fancy Feast, I gave Loki her “usual” breakfast of Purina Kitten Chow. She rushed over to her food bowl, sniffed it, put her nose up in the air and walked away!! I laughed and said “be that way… you’re not getting any Fancy Feast ’til tonight.” After about a half hour she gave up and reluctantly ate her dry food. It’s been a few weeks and we now have a good routine going. As you can see from the picture, her favorite resting spot is in the pantry lying on a box next to the Fancy Feast. I also got her the Fancy Feast Gravy Lovers, but she much prefers this turkey formula. She’s a very happy kitty! Before knowing what my new kitten was accustomed to, I bought 3 different brands. This was the only one she would eat. The others were more expensive so I didn’t wan them to go to waste so I mixed them all together in an effort to save dollars. Now she picks out each individual piece of Blue Buffalo and eats it, and drops the others to the side. Guess she showed me. This seems to be the highest quality at the best value around. I feel as I am giving my pet a safe and healthy diet with this. I will continue to buy it. Great post. If I ever get a kitten, I will refer to it. This article is packed with good info and I’ve found it just in time as I’ve just taken in two kittens. I’ve been looking at the Whole-Earth Farms dry food for kittens but I admit I know little about kitten and cat nutritional needs. I have much to learn but I’m wondering two things. 1) I know taurine is essential for cats and kittens but what percentage of it in their food is good for them? Or how much mg’s should they get? 2) What are your thoughts on the Whole-Earth Farms dry food? Is it good or should I choose one of the dry foods you’ve listed here?